Oscar’s Grind is a progression strategy that focuses on increasing your bets based on positive outcomes when you wager. In Germany, the system is sometimes referred to as Hoyle’s Press, and in France, you will sometimes hear it called Pluscoup progression. All of the terms refer to the same method of play, which is based on the concept of betting on the outside even money chances–the reds, the blacks, the lows, the highs, the odds and the evens (read more about the bets here). 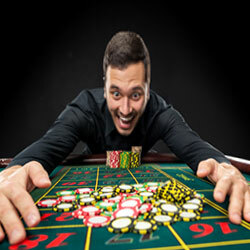 This is similar to the best roulette system that we recommend everyone to try. More advanced players can also apply the system for other bets, such as playing on the dozens or on the streets. You can wager any amount that you choose, provided that it suits your budget and meets the table minimums. The driving idea behind Oscar’s Grind is that most players will go through periods of several wins in a row and periods of several losses in a row. Streaks are common, and as a result, you can follow the winning or losing trend to maximize the amount that you win and minimize the amount that you lose. In other words, during periods of loss you bet low, and then as you begin to win, you increase the amount that you bet in order to try to make as much money as you can while the streak continues. This method of betting allows you to lose less over time and also makes it possible to slowly increase your bets, unlike some other methods that require you to take big gambles when you start to win at the roulette. If you win on your first bet, you win one unit and you restart with a new grind. If you lose a bet, you always bet the same amount on the next spin. If you win a bet, you would bet one more unit than the amount that you won on the next spin. The exception to this is if you need less to win one unit of profit. In this instance, you would only bet the amount needed to become profitable. You continue to bet until you reach one unit of profit. Then, you begin to play again or quit playing roulette. As you can see, with the last spin, you only needed to win 2 units in order to reach the profit goal of +1. Because of this, only 2 units were bet instead of 3. To understand the benefits and drawbacks of Oscar’s Grind, examine these two examples, the first of which is positive and the second of which is negative. In this example, there were 19 spins. During the course of play, you won only 6 times, and you lost 13 times. Still, in the end, you were able to make a profit even though you lost more times than you won. This shows you how Oscar’s Grind can allow you to overcome even very long losing streaks. When you began to win, you were able to quickly make back the money that you lost. With this example, you played 19 spins. You won eight times, and you lost 11 times. In the end, you are still behind by 8 systems. If you had used other systems like the Labouchere method, you would have been able to ultimately walk away with profit. The reason why the system failed here was that the wins were spread out too much. You never once had a winning streak, so you were unable to recoup the money that you lost. With this positive scenario, you spun 23 times, and won only 5 times. You lost many more times than you won, but you were still able to make a profit of 2 units. To win, you never once had to bet more than 4 units. As you can see from the examples, Oscar’s Group is a simple positive progression system that works well whenever you are fortunate enough to end up in the midst of a winning streak. Even if you end up in a lengthy losing streak, you can return to a profitable outcome with the system. Give it a try at an online casino to see it in action for yourself.